thunderstrokes: Unscrewed T-shirts are here!!! 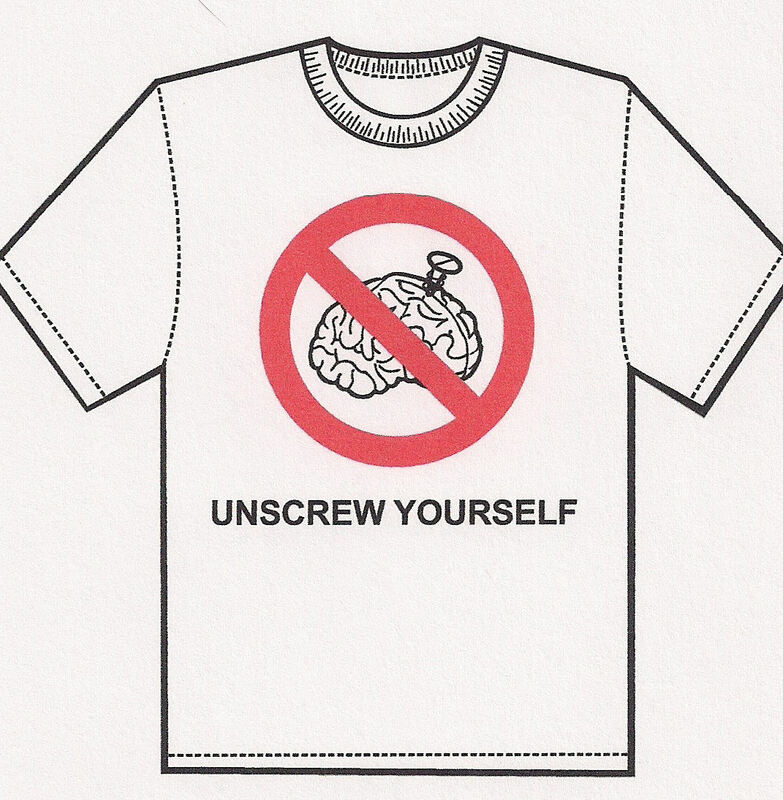 Based on the enthusiastic response to the sentiments contained in the “Unscrewed” post from 8/13, we had a small batch of “Unscrew yourself” T-shirts made up. They are now available to order for near-immediate delivery (depending on where you live and how fast I can drive). Click on 'read more' to see the back side of the shirt and get the rest of the details. The shirts are selling for $12 each, which is slightly below cost, as we’re not looking to make a profit, but rather to spread the message to the masses about the importance of unscrewing ourselves. We printed up a very limited quantity in medium, large, and extra large. 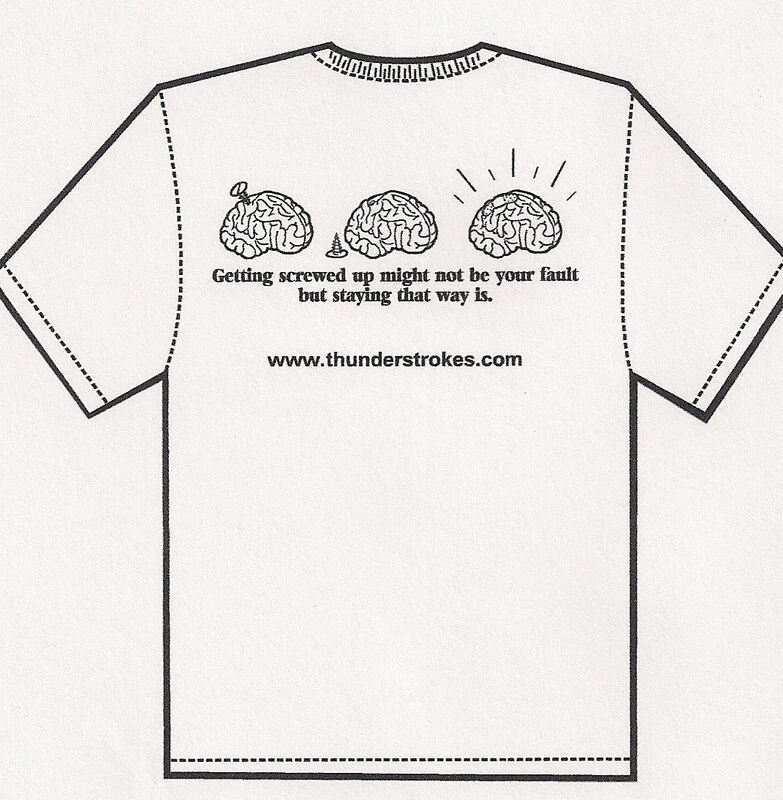 The shirts are white, 100% cotton, and have the “Unscrew yourself” logo on the front, with the “brain unscrewing” graphics on the back, along with the slogan “Getting screwed up may not be your fault, but staying that way is.” The thunderstrokes web address appears below the slogan. You know you always wanted to own a first edition, why not make it a t-shirt? I will number and sign your shirt if you request it, for added authenticity, and/or insurance coverage purposes. We may add colors, styles, or other options, if demand demands it. In the meantime, I would love to know what you think of the first official thunderstrokes shirt, and any suggestions you may have. Please feel free to post a comment, or email me at kevin.thorson7@gmail.com. If you're interested in purchasing a shirt, please email me at kevin.thorson7@gmail.com with the size and quantity you'd like. We ordered a very small number of shirts, so please don't be disappointed if we've run out of your preferred size. If you wish, we can hold your order until we produce another batch. This is all very low budget and small-scale, so please keep in mind we're making this up as we go. Thunderstrokes: Not just a blog, it’s a t-shirt and a blog! Thanks Kylie. I hope it's the first, 'cuz it was created right here on good ol' thunderstrokes! Thanks for the comment, and thanks for reading!